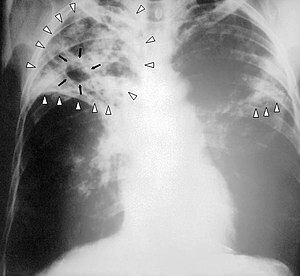 Chest X-ray o a person wi advanced tuberculosis: Infection in baith lungs is marked bi white arrae-heids, an the formation o a cavity is marked bi black arraes. Tuberculosis, MTB, or TB (short for tubercle bacillus), in the past an aa cried phthisis, phthisis pulmonalis, or consumption, is a widespread, an in mony cases fatal, infectious disease caused bi various strains o mycobacteria, uisually Mycobacterium tuberculosis. This page wis last eeditit on 21 Mey 2015, at 14:42.